Online content has two audiences: people and search engines. Appealing to both takes the combined efforts of a technical minded SEO Content Strategist and a Social Media expert who is plugged into the world. One without the other results in either good content that never gets found or crappy content that no one wants to read. Every industry has a set of targeted keywords. Find that list of keywords that yields the highest traffic and highest potential to convert into sales, leads or whatever it is that your company is trying to produce. Based on the keywords that you are targeting you can get a pretty good idea what kind of articles you want to write. But don’t jump the gun and start writing your content quite yet. In order for this piece of content to be effective you will need the advice of your industry leaders. Contact the top 10, 20 or 30 people in your industry’s network, assuming you already have a network of influential people. These people are on Twitter, Google Plus, Facebook, or if your company is old school you can find them at their AOL email address. Whatever way your industry communicates make sure you are there and active in conversation. Ask these people if they like your content idea and get their expert advice on what you should write. Better yet, get them to write it! Check out “crowd-sourcing” as an option. Now compile all the information you have gathered from all your network. Make it nice, quote people who helped you develop this content. They will greatly appreciate that you took the time to listen to them and they will DEFINITELY return the favor. Most importantly make sure your title includes the keywords that you are targeting. People who link back to your site will often copy and paste your title as the anchor text if they reference your article from their blog or website. Not to mention scraper sites will copy your articles and index your content across the internet based on your titles. Now email, Tweet, share and G+ it out to all the people that were involved. That small group of people, assuming they are big voices in your industry, will naturally share your content which will result in many natural links, Facebook shares, Tweets etc. This will all result in higher rankings which will increase traffic. And if you did your keyword research right, and developed strong titles based off of those keywords, then people will naturally link back to your site with anchor text derived from your titles. Great insights as why people share information and why it blends. 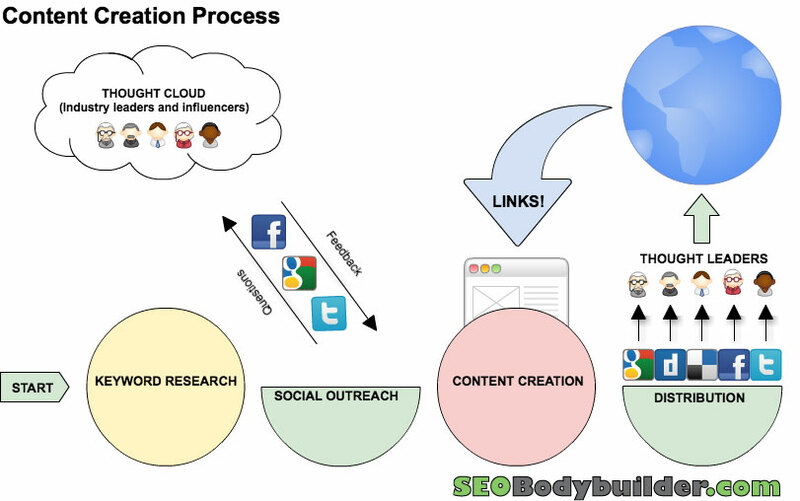 I believe right Social media strategy is also a tool to increase the search engine optimization information. A very clear and step by step post- as how to initiate the social media strategy in order to keep the points which is required. Great Post- Its like Minimum Viable Product philosophy presented for successful social media marketing strategies.